Today marks the forty-first anniversary of the death of, arguably, one of the men who most influenced Western thought in the Twentieth Century. He also happened to be one of the men I admired most greatly, so it seems fitting that in the first year of my blog, I should mark his passing. 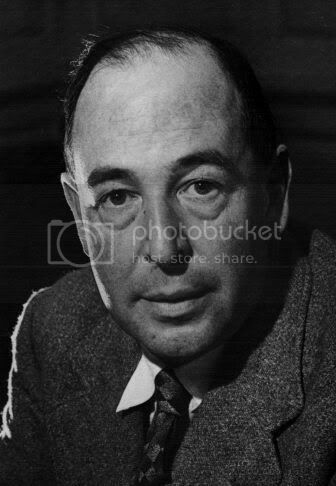 I can't find the exact quote, but Lewis once made a comment to the effect that the only books we'll have in our library in heaven will be those we lent to friends, and that every bit of damage they had done to them would have become beautiful calligraphy or woodcuts. This is a high school in Bratislava, Slovakia, where the students study in their native language and in English. The students call English "the language of freedom." And, even more appropriately, they aren't asking for cash. They're asking for books. There's an indepth list of desired books over at STG. I plan on donating a Lewis tome or two. Go see what you can do. BAGHDAD, Iraq, Nov. 21 - A marine who appears to shoot and kill an unarmed and wounded Iraqi prisoner in an NBC News video was not aware that the incident was being recorded, and moments later approached the cameraman with seemingly remorseful words - "I didn't know, sir, I didn't know" - according to the first public description of the events by the cameraman, Kevin Sites, since his brief and somewhat ambiguous initial report. Now, at first this seems pretty damning. But I began to wonder -- did the Marine specifically say he didn't know he was being filmed, or was he referring to something else? Bear that in mind as the article continues. No weapons were visible inside the Falluja mosque where the shooting took place, on Nov. 13, and the wounded Iraqi made no sudden or threatening moves before the marine shot him, Mr. Sites writes on his Web site, kevinsites.net, in an entry posted Sunday night. By whose definition or criteria is Mr. Sites judging the threat present or absent in the terrorists actions? Again, bear this question in mind as we continue. complexity of battle. Nevertheless, he said of the incident in the mosque, "it appeared to me very plainly that something was not right." Not to detract from Mr. Sites' credentials as a war correspondent, but that's a far cry from being a war fighter. What he sees and how he interprets it is different from the man who actually must make the decision to kill or not. His account also raises new questions about another group of marines who entered the mosque just before Mr. Sites and fired on the prisoners - they had been left there, already wounded, after a battle the day before. Mr. Sites was so surprised that the prisoners he had seen there the day before had been attacked again that he informed a Marine lieutenant of the fact before the final shooting - the one he captured on tape - took place. The video obtained by Mr. Sites has received sensational play around the world, particularly in the Arab news media. Mr. Sites calls the posting on his Web log an "Open Letter to the Devil Dogs of the 3.1," or the Third Battalion, First Marines. "Since the shooting in the mosque, I've beenhaunted that I have not been able to tell you directly what I saw," he wrote, "or explain the process by which the world came to see them as well." He begins by writing, "I'm not some war zone tourist with a camera who doesn't understand that ugly things happen in combat." [neither are you a soldier who actually has to make a decision on the split second, but someone who can record events, then judge them in hindsight.] Despite his attempt to be fair, he said, since then Falluja video was broadcast on Nov. 15, he has been "shocked to see myself painted as some kind of antiwar activist." Mr. Sites has received abuse and death threats on some Web sites, and has shut down the discussion section of his own. He said the marines he was embedded with arrived at the mosque on Nov. 13, and after a series of other events, he heard shooting inside. The other set of marines emerged and were asked by a lieutenant, "Did you shoot them?" What other events? Do they have any relevance to what happened next? And if so, why is the Times less descriptive of them than of the antecedent events within the mosque? I have long been skeptical of the NYT's journalistic dispassion, and I am disinclined to believe they are giving both sides of the story equal treatment. "Roger that, sir," a marine responded. But when the lieutenant asked, "Were they armed?" the marine just shrugged, Mr. Sites wrote. Inside, Mr. Sites said he was was surprised to see the wounded men from the battle the day before, now shot again. "There don't appear to be any weapons anywhere," he wrote. And just how close an inspection was he able to make in the heat of battle? Or is this just his impression? He was videotaping some of the wounded men when, in the background, a marine yelled that one of the others was "faking he's dead." "Through my viewfinder I can see him raise the muzzle of the his rifle in the direction of the wounded Iraqi," Mr. Sites wrote. "There are no sudden movements, no reaching or lunging." It doesn't take a lunge or much of a reach to pull the pin on a grenade. That has happened over there. Again, the question of experiencial perspective and definition of "threatening" are key here. The Marine had an extremely limited amount of time in which to react, in which to make a life or death decision. Had he hesitated and the man truly been a threat, it might very well have been that Marine, his buddies, even Mr. Sites. I dare Mr. Sites to state he could have made the decision any better had roles been exchanged. Then the marine fired. "There is a small spatter against the back wall and the man's leg slumps down," Mr. Sites wrote, in what was apparently a suggestion that the man had been alive. "Well," another marine said, "he's dead now." Mr. Sites wrote that he could feel "the deep pit of my stomach." The marine who fired, who had been angrily shouting, suddenly changed his tone. "The anger that seemed present just moments before turned to fear and dread," Mr. Sites wrote. I should think so. That's pretty common after battle, from what I have been taught. Furthermore, if, as Mr. Sites claims, the Iraqi wasn't a threat, and the Marine only realized this after the shooting was over, you can be sure he would feel remorse. Furthermore, might this realization also explain the Marines comment, "I didn't know, sir, I didn't know" much better than the assumption that he was referring to the presence of the camera? "I can't know what was in the mind of the marine," he wrote. "He is the only one who does." This is true. And this is why those of us who have not had to bear the burden of uniform would do well to be circumspect in our criticism. If the Marine is proven to have violated the UCMJ or the ROE's, he will be disciplined. I for one am glad that those responsible for executing such discipline have a fuller perspective on events than I.
Blogfather Rusty is not as understanding towards Sites as I. Talk About Wagging the Dog! Apparently the Power Behind the Throne has his own blog. I probably should wait until tomorrow or Wednesday to post this (I won't be blogging on Thanksgiving) in order to stretch my blog mileage, but it's in my mind so I think I'll toss it out there now. As some of you may know, I love to cook. After the History channel, my favorite network is the Food Network (Alton Brown is a GOD!). But come Thanksgiving, something happens to the network that is, well, disturbing. In the spirit of Thanksgiving and Cuisine, they attempt to show you all these nifty gourmet variatons on traditional dishes -- Pumpkin Soup, Cranberry Souffle', etc. Don't get me wrong -- many of these dishes sound wonderful. But for Thanksgiving dinner, there are certain dishes that just must be there or I feel... incomplete. For a twist, use gingerbread cookie dough for the crust. make sure to wrap the crust in foil or it will burn. The twist here is to use Orange Juice and Apple cifer in equal parts instead of water and sugar. Add some cinnamon, a dash of vanilla, some orange zst, and a shot of Grand Marnier. Replace the white bread croutons with sourdough. Make sure you saute the onions and celery in butter, and us STOCK, NOT BROTH!!!!! This one's from The Feared Redhead, with some added help from Alton. Brine the Turkey, butter the skin and add salt, pepper, herbs and spices. Put an apple and an onion, both cut in half, in the cavity, along with a bay leaf and a rosemary sprig, and inject the bird all over with cognac and champagne (or non-French substitutes). Enjoy. Tell me if you try any of them.